If you've tried deep fried turkey then you've probably wanted to make your own. 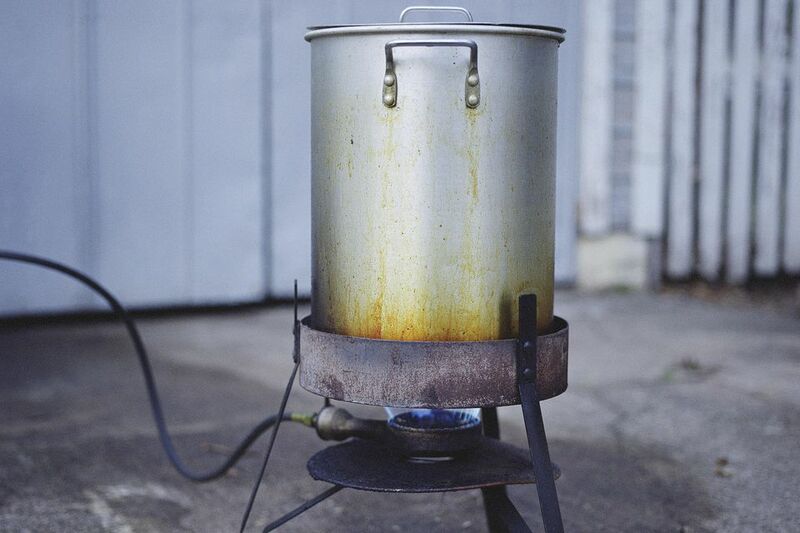 Besides the turkey fryer safety issues, you've probably noticed that this can be a costly endeavor. In addition to the right turkey fryer, you need a lot of oil to fry a regular sized turkey and since, like most people, you don't cook very many turkeys a year the expense can seem too much to justify. But did you know that you can reuse oil for frying? Under normal conditions, oil can be heated for up to 6 hours. A deep fried turkey can cook in under an hour (3 minutes per pound) so you can fry six items on six different occasions with a single batch of oil. The first step is choosing the right oil. An oil with a high smoke point will let you heat it up to a high temperature without it breaking down. When oil begins to break down it will go rancid and ruin the flavor of anything you cook in it. You don't have to worry about bacteria since it will be killed off when the oil heats up, but rancid oil should not be used. Good oils for frying turkeys include peanut oil, corn oil, canola oil, cottonseed oil, safflower oil, soybean oil, and sunflower oil. Once you've finished your cooking and let the oil cool down, you can prepare it for storage. The first trick is to get rid of all the little things floating around in the oil. You can do this by pouring the oil through some cheesecloth over a funnel back into the container that the oil came in. Of course, if you used 10 gallons of oil it will weigh around 80 pounds. The easiest way to do this task is with an electric oil pump. This convenient little tool makes getting the oil out of the pot quick and easy. If you plan to do a lot of frying, this is a tool you definitely need. With the oil filtered and in your storage container you need to find a cool, dry, and dark place to store the oil. It would be great if you could keep it refrigerated, but if you are like me you don't have that kind of space. Any place you have that fits the criteria (but won't let the oil freeze) will work. Properly stored, your oil will last but to 6 months. Before you move the oil to use it again examine the oil. If it has separated or smells bad you will need to dispose of it and start with a new batch. Otherwise pour it back into your pot and heat it up as normal. Remember that you need to keep the total heating time of any oil is six hours. Don't let it preheat for too long and turn off the burner 5 minutes before the turkey is done to start it cooling down as quickly as possible. Once your oil hits the six-hour mark you need to dispose of your oil. When your oil is done it is time to get rid of it. Problem is, how do you dispose of several gallons of used cooking oil? Well, thanks to modern ingenuity you can turn that oil into fuel. Yes, old cooking oil is more and more frequently being turned into biodiesel. Contact your local government to see if there is an oil collection point in your area. You might even be able to make a buck or two on your contribution. Otherwise, most areas have cooking oil deposit sites to safely dispose of your old oil. Pouring down the drain is just going to clog up your pipes.